Hi Everyone and Happy National Doughnut / Donut Day! Honestly I don’t know how to spell doughnut/donut? What way is the correct way? I guess I’ll spell it the way I grew up with and that’s Donut!!! Well, anyway today is a big day in the world, ok USA. Today is the day to get up early and make the donuts. I can’t believe I actually got a food holiday on time. Well, anyway since it’s a big day, what did I do? But make donuts of course!!! 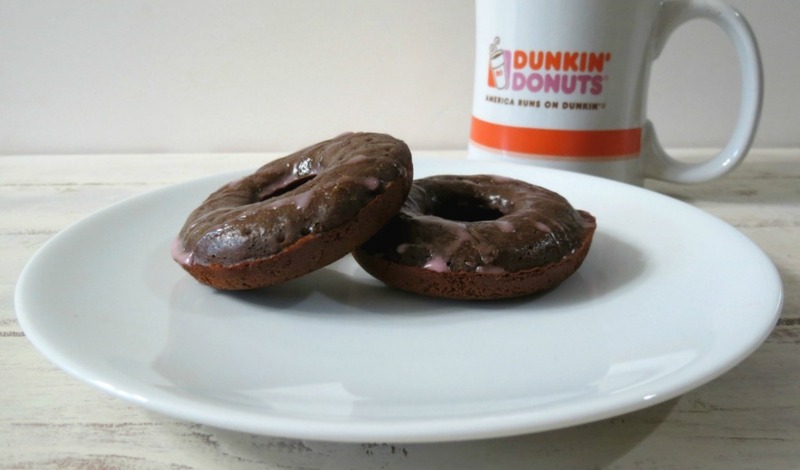 Even though my favorite donuts of all time are the horrible, bad for you ones with the whip cream in the center and chocolate on top, I’m sharing with you one of my other favorite ones and that is Chocolate Cherry with sweet, sweet glaze! 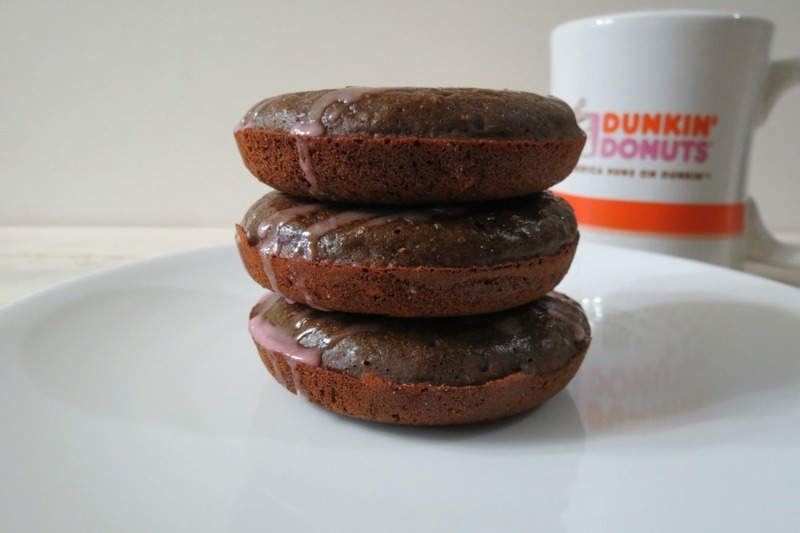 Now don’t worry about the guilt of having one of my donuts, they come in at only 84 calories! Woohoo! That means I can have two!!! The first time I fell in love with donuts was when I was growing up and every once in a while my Dad would bring home Dunkin Donuts. I remember that pretty pink and orange bag filled with lots of goodies. My dad liked the French Crullers and I loved the glaze and jelly donuts. I miss them so much. But I do get to eat one at least one, once a year. Living in California now, we don’t have Dunkin Donuts, but we do have Krispy Kreme, but I’m not a fan, because in my head nothing compares to DD. However, today I get to actually celebrate it at DD, since I have one not to far where I am staying on my vacation. Yah! Though there is a roomer, that DD will be coming to CA in 2015. I probably won’t go, since they will be local. I’m afraid I’ll lose the love for them. But I do love their french vanilla coffee. None of that fancy stuff, just the traditional coffee. I lave the fancy stuff for Starbucks. I decided on making chocolate cherry donuts because I have had a jar of maraschino cherries staring at me every time I open my pantry. 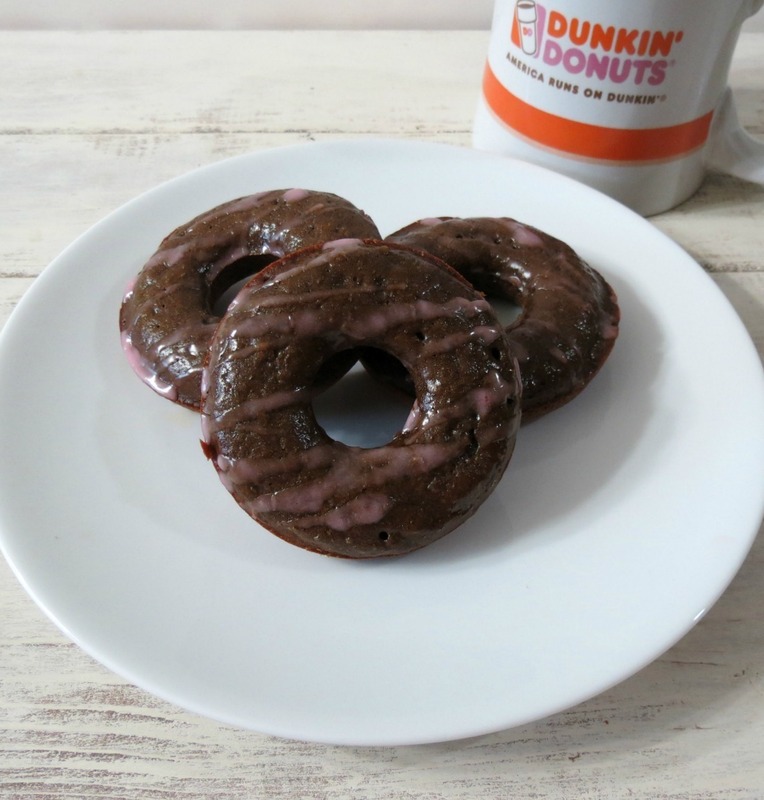 I love chocolate and cherry together, so I thought they would make a great donut and I was right. 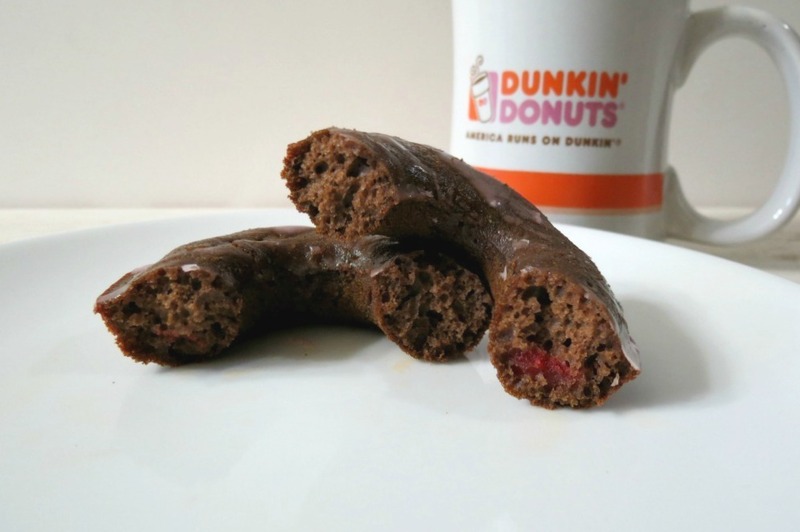 These donuts are sweet, light and when you take a bite you get a nice soft bite of cherry. I added 20 cherries into my donuts thinking my batch would only make 12 donuts, but I ended up with 18 donuts, so next time I will had more cherries. I kind of recommend you do too!! 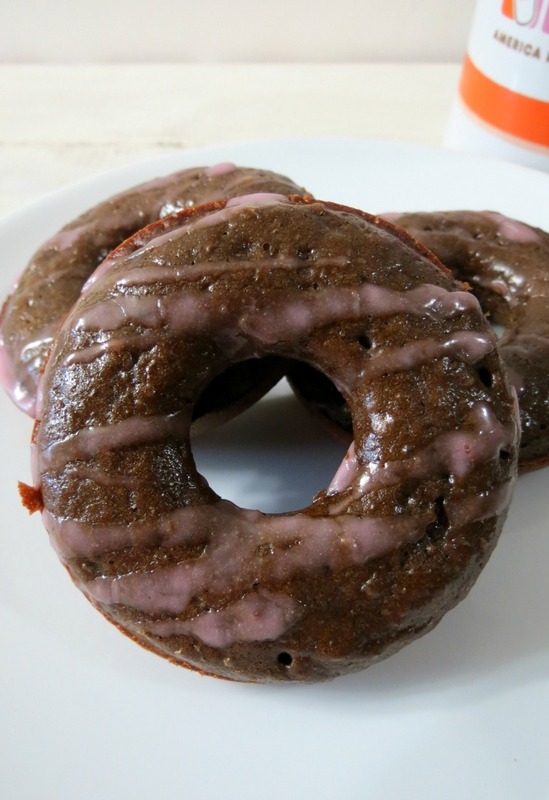 These donuts are pretty easy to make, and only contain one bowl and a few donut pans. I have one round shape and the other is heart. I have had these donut pans for a couple of years since the big donut phase came around. I honestly barley used them, so I am glad I have a purpose now. Last time I made donuts is when I started blogging about a year and a half ago. I went donut crazy one day and made a ton! A ton! I packaged them up and took them to my Husbands work for a Saturday treat!! You can check out the pictures here, if you would like. 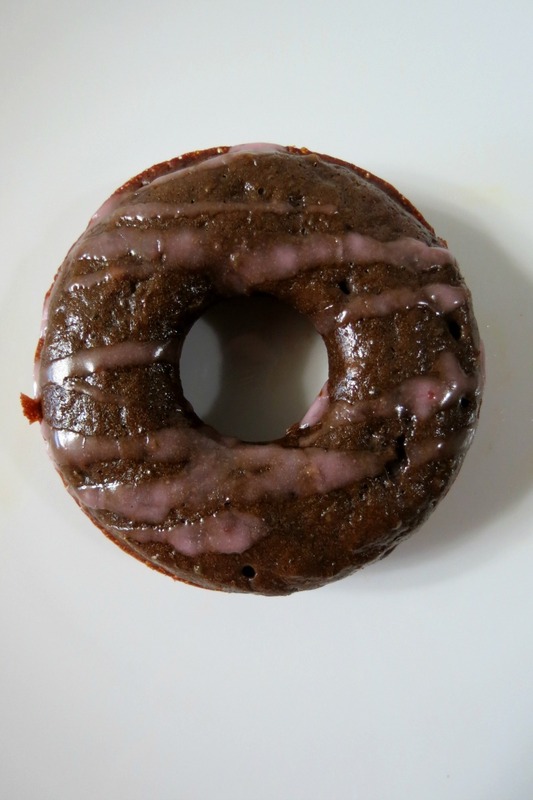 A light, fluffy baked chocolate donut filled with cherries and topped with a sweet glaze. Preheat oven to 325°F. Spray three 6-cavity donut pans with nonstick cooking spray. Sift together cake flour, cocoa powder, sugar, baking powder,espresso powder and salt in a large mixing bowl. Whisk in milk, cherry juice, eggs, and butter and beat until just combined. Fold in chopped cherries. Fill each donut cup until about ⅔ full. Bake 8-10 minutes, or until the top of the donuts spring back when touched. Cool in pan for about 2 minutes before removing from pan. Meanwhile to make the glaze; in a bowl add powdered sugar and cherry juice; mix until combined. If you want a thicker glaze, add more powdered sugar. Drizzle glaze over donuts. Best served fresh on the same day. I know donuts are not the healthiest things you can eat, but they are fun to have every once in a while. 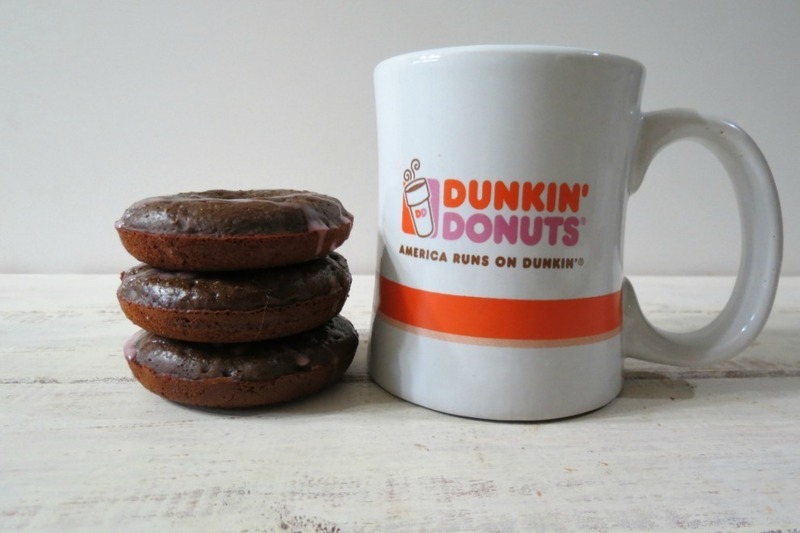 I did want to share with you that Dunkin Donuts is giving away a free donut today with a purchase of any beverage. Also Krispy Kreme is giving a way a free donut, with no purchase necessary. If you do go, make sure you pick a healthier donut, like a baked cake donut, but if you have to go for the fried donut, stick to traditional glaze, they are the least amount of calories then the other donuts. I heard DD is debuting a new donut today the key lime pie one. I may try that or get a glaze donut with sprinkles. This is after all my one donut a year treat! I can’t wait!! As you can see from my pictures, I do have a love for DD and my friends know it. I have DD K-cups, DD coffee mugs, DD tank top and DD Christmas ornament. My Friends all know and think I’m crazy! Especially when I do travel, I check the airports and hotel for DD to be near by. I need help! lol I’m just glad they don’t send donuts! Oh and like donuts you get at the shop, my baked donuts are best to eat them the day you make them! I also wanted to let you know I may not be around much to answer any questions or comments you leave, but I’ll try. But don’t worry I have a very odd and unique recipe for you for tomorrow and a wonderful summer time recipe for you on Sunday! You mean there are others who know DD is by far superior to Krispy Kreme?!? I was beginning to think I was the only sane person in the world! These look amazing – although I may have to swap out the cherries for blueberries. Woah! I think I need to go a doughnut pan STAT! Now – I’m also a DD gal and now you have me wanting a french cruller in the worst way!! Guess I’ll be grabbing one on my way home 🙂 Love your take on a chocolate donut! I’m totally sending you the doctor’s bill for the lump on my head. You think I’d learn not to try to look so closely at yummy food. I swear they had to peel me off of my computer screen. Freaking donuts man, they are my downfall. I totally missed out on donut day today! These look so yummy! Hi there! Your recipe ingredient list says baking soda, but the instructions say baking powder. Can you clarify which it is? Hi Amanda, It is baking powder. Sorry about that. I will have to fix that. Thank you for the catch.